But it doesn’t have to be complicated or expensive to make your pharma exhibition stand work harder for you. A specialist supplier to the healthcare and pharmaceutical industries, with over 30 years’ experience designing and building eye-catching displays, here are 20 top tips to help you improve your pharma exhibition stands, without breaking the bank. Establish your goals. Set out why you’re attending each exhibition. It’s not good enough to exhibit just because your competitors are doing so, or because you attend every year. Understand what your customers want. Before you do anything, make sure you understand why your visitors are likely to be attending a particular exhibition in the first place. What is it they actually want? Design a pharma stand that gives it to them. Once you have figured out what’s likely to be of value to your customers, design an exhibition stand that delivers. For example, if you are sharing complex medical information, consider educational models that offer the opportunity to translate theory into practice and provide a valuable hands-on learning experience for attendees. Book a good spot. It doesn’t matter how good your stand looks if nobody sees it. So making sure you get a great space in the hall is essential to your trade show success. At Apex, we can advise on likely delegate traffic flow, and assess any features of the building that might affect you on the day. If it’s too late and you are stuck with a stand in a bad space, we can also devise some innovate and quirky features to make it work for you. Let people know who you are. Brand identity is crucial when it comes to designing a successful pharmaceutical exhibition stand. Your stand should convey who you are and what you do at a glance. Make it engaging. A successful exhibition stand design will help you to attract and retain visitors ahead of your competitors. So, as well as making sure your stand looks good, make sure that it is a catalyst for conversations. Invest in the right type of stand. When it comes to maximising your exhibition presence, the first step is to choose the right stand for you. Whether you go custom built or modular depends on your objectives and needs. Don’t forget the basics. As well as thinking about what your exhibition stand will look like, you also need to consider the broader logistics. For example, do you have all the AV equipment ordered and tested and have you confirmed that services such as electrics and the internet will be in place if needed? Add some bells and whistles. Integrating technology and exciting features into your next exhibition stand design could provide that much-needed return on investment. For example, video, iPads, touch screen data capture, triggered motion sensor tech to catch the eye, interactive screens, holographs, and many other ingenious features and gadgets can be used to connect with visitors in an immersive way. Think about lead generation. Technology exists that captures leads and integrates them into your CRM systems. This will let you forget about the hard sell and focus on generating beneficial conversations with more prospects at the event. Make sure you are compliant. Collecting data a great way to follow up with people after shows. But, it is essential that any data you collect in return for providing information meets the relevant regulations such as the GDPR and any sector-specific rules. Promote your exhibition presence. To attract and engage visitors start promoting your event long before the show starts. To do this, you can use social media and bespoke content to demonstrate what people can expect at your stand. On the day, be sure to keep the momentum going with great incentives and giveaways (just make sure these are compliant with the relevant industry regulations). Here are some things to be aware of when designing and promoting an ethical pharma exhibition stand. Be authentic. Over the last few years, visitor experience has become a crucial part of any exhibition strategy. To provide visitors with a real feel for your products or services, why not incorporate hands-on demo areas that truly allow your company to shine? Provide a personal exhibition experience. Personalisation is in vogue. As such, exhibitors should look to create shareable, immersive and disruptive experiences that put the individual at the heart of everything they do. Create a sense of event. We are now living in the “experience economy”. So, to stand out from the crowd, your exhibition stand has to reach out and appeal to attendees in new and absorbing ways. Help people to network. Rather than just creating a stand and hoping people make the opportunity to interact with each other, why not create a stand that proactively encourages conversations? This can be as simple as incorporating cleverly designed break out areas into your exhibition space. Do the maths. To find out what you need to make your exhibition presence a success, set out how much the exhibition is costing you to attend, and attach a monetary value to each new customer/lead. Doing this will help you see the tangible value of your exhibitions and help you decide whether to reinvest in the show next year. Make your investment last. Rather than focusing on the up-front expense, consider the whole life cost. For example, if you invest in a reusable pharma exhibition stand that you can take to five different events, the amount you have to make from each tradeshow to deliver ROI can be significantly reduced. Choose the right exhibition stand company. When it comes to guaranteeing a winning exhibition presence, the right partner is vital. At Apex, as well as creating eye-catching exhibition stands, we also remove the stress, boost footfall and make your tradeshows a success. To ensure compliance you’ll also want to ensure your partner has industry-specific knowledge. Download our tradeshow checklist. Brought to you from the experts at Apex, our handy checklist ensures your tradeshow presence is maximised. Download here. 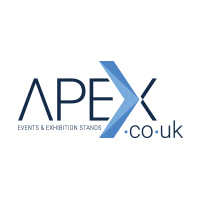 Working in all healthcare and pharmaceutical areas, and one of the UK’s leading exhibition agencies, at Apex we are at the cutting-edge of our industry and know what it takes to create a successful exhibition stand – whatever your budget. To find out more about how we can keep you ahead of the competition, contact Apex today, or call on + 44 (0)1625 429370 to discuss your requirements in more depth.